Registered members enjoy free and full access to all my independent reviews, can post comments on reviewed hotels and restaurants and will receive regular updates and member-only offers. Click here to sign up - it's free! Situated on the banks of Blessington Lakes with easy access to motorway. Stunningly situated on the banks of Blessington Lakes and with fab views of the Wicklow Mountains, Tulfarris Hotel & Golf Resort boasts some of the most spectacular atmospheric scenery that Ireland has to offer. Just 45 minutes from Dublin City, Tulfarris offers an escape into an unspoiled idyllic setting, with five star facilities, that is only a stone’s throw away from the capital making it perfect for couples, friends, family or business conferences and events. The hotel itself is modern and stylish, with all of the rooms being tastefully decorated with lots of light whites and greys meeting stylish oak furniture and velvet adornments. Their Deluxe rooms, which can be booked as doubles or twins, feature 6ft King size beds (or 3ft twin beds), 26’ TV’s with DVD player, safe, en-suite bathrooms with underfloor heating and free WiFi. If a little luxury isn’t enough, then live a little larger with one of their twenty marvellous suites. With living rooms, second bedrooms, dining tables, compact kitchenette with microwave and fridge, not to mention private balconies/patios on the ground floor, and breath-taking views, a suite at Tulfarris will ensure that you spend your visit firmly planted in the lap of luxury. Children age 3 and younger can stay for free if sleeping in a travel cot. There are also some fantastic rooms available in the classic 18th century manor house. 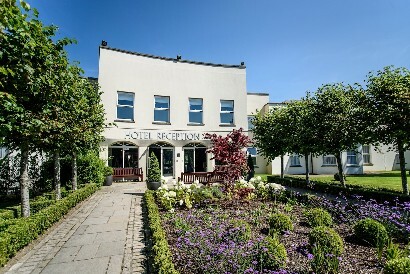 With impressive lakeside views, each of its seven guestrooms, which are named individually for local Blessington flora, are uniquely designed and offers guests an elegant, olde-world atmosphere without sacrificing any of the modern comforts; and, guests at the Manor House also have full use of its beautiful drawing rooms and library. The Manor house is the perfect spot for private birthday parties, events or for wedding groups. For dinner, find your way to the beautiful Limetree Restaurant and get ready to enjoy some truly delicious food that they are proud to say is locally sourced, fresh and organic. The style here is contemporary Irish, with world cuisine being given that modern Irish flair. Starters include dishes like Irish oak smoked salmon with blood orange, fennel, radish and cured beetroot or perhaps natural smoked haddock with leek fish cake, whilst the mains features offerings like a pan seared darne of Atlantic hake; slow-cooked pork belly or a grilled fillet of sea trout. If you’re the active sort, there’s plenty to see and do at Tulfarris from archery to tennis to bike rental to kayaking. If you like a good stretch of the legs, then head down one of their wonderful walking trails and drink in the world of natural beauty surrounding you. But, for many, the big draw at Tulfarris is their awe inspiring, beautifully maintained, 18-hole championship golf course, designed by renowned course architect Patrick J. Merrigan. Set over three peninsulas at the shores of Blessington Lakes, this exciting panoramic course is sure to drop the jaws of even the experienced golf nut. They also offer a fully equipped pro-shop, putting green and driving range, as well as buggy, trolley, golf club hire and changing rooms. If all that activity is the opposite of what you want on your trip, don’t fret, simply book a pampering beauty session at their beauty treatment rooms. From Swedish hot stone to Indian head massage, facials to mani-pedis and lots lots more, you’re sure to leave with a smile on your face and a pep in your step. So, if you’re looking for that perfect getaway, then look no further than Tulfarris. From food to facilities, scenery to staff and everything in between – Tulfarris has it all. More Great Places To Stay!